This document summarises configurations for consuming and producing messages using MSMQ. We will also describe some best practices related to the MSMQ infrastructure. It assumed that you have a passing knowledge of Interlok and its configuration with a basic understanding of MSMQ. Before you can start Interlok that is able to consume or produce from or to MSMQ, you must first install the Interlok MSMQ sub component into your Interlok installation. All available Interlok sub components are shipped with the standard Interlok installation. Simply navigate to the optional directory at the root of your Interlok installation. Copy the java archive files named interlok-msmq.jar and izmcomjni.jar from the sub component directory to your lib directory in the root of your Interlok installation. 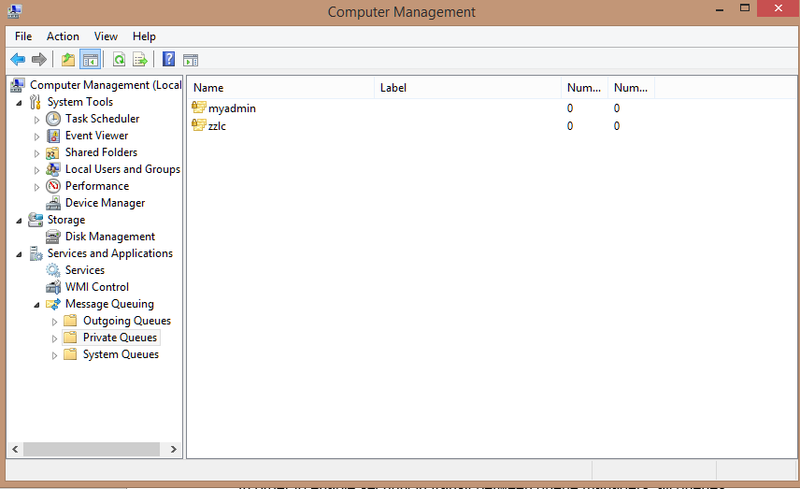 Finally you will also need to copy the izmcomjni.dll into the lib directory. All configuration examples for can be found in the docs/optional/example-xml directory. The JRE needs to be the 32bit version of the JRE, as the native bridge between Java/ActiveX is currently not 64bit compatible. If you have installed using the bundled JRE, then this will be the 64bit version, so you need to install and supply your own JRE. Note: Interlok must be installed on a Windows XP (or higher) platform. Interlok must be installed on a Windows XP (or higher) platform as it makes use of the underlying ActiveX controls that are available once MSMQ is enabled. There are no other requirements, provided MSMQ has been enabled prior to your Interlok installation. Note that versions of MSMQ prior to 3.0 are not supported. This means that platforms prior to Windows XP Professional and Windows 2003 Server are not suitable for running this type of Interlok instance. You should still be able to send and receive messages from platforms using MSMQ 1.0 and MSMQ 2.0; however, the platform that Interlok runs on must be capable of MSMQ 3.0. 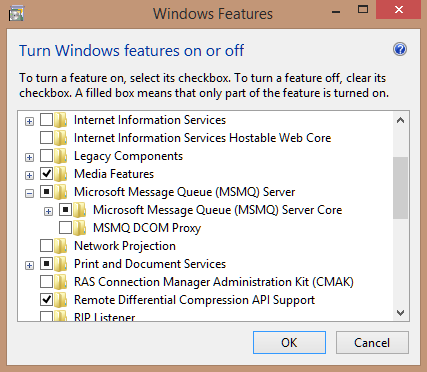 Initially, there is little or no configuration required for MSMQ other than to start the service (if not already automatically started), and to create a queue. You will need to be a domain administrator if you wish to create public queues that are published in Active Directory. For a simple loopback test on the local machine, a private queue is sufficient. In order to enable security in transit between queue managers, all queues have to be published in Active Directory. This can cause issues where there are issues with active directory as the domain controller needs to be queried each time. To enable message encryption on a queue, it should be created with a privacy level of either optional or body. If created with a privacy level of body, then messages that are not encrypted will be discarded. msmq-byte-array-message-format This generates an MSMQ message body that has a variant type of VT_UI1 VT_ARRAY which allows internal MSMQ auto conversion to enable interoperability with legacy .NET applications. Configure Interlok with 2 channels, one connecting the file-system to standard-msmq-producer, and the other using msmq-polling-consumer and writing to the file system. Both components should have an msmq-connection configured; there is example configuration for each component in the examples directory; however using the defaults, and having a minimal configuration will be fine for the scope of a loopback test. From the example above you could either use DIRECT=OS:.\private$\zzlc or .\PRIVATE$\zzlc. Along with some simple string based fields that control the transaction and share mode; both producers and consumers contain a list of PropertyMapper objects which will be responsible for mapping various parts of AdaptrisMessage into corresponding internal MSMQ Message fields. msmq-message-id-mapper This maps the AdaptrisMessage unique id to and from the corresponding MSMQ message property. msmq-metadata-mapper This maps an item of AdaptrisMessage metadata to a specific MSMQ message property (and vice versa). The metadata-key element determines the metadata key that will be used to derive the content of the mapping. msmq-xpath-property This resolves an XPath against the AdaptrisMessage payload and sets a specific MSMQ message property based on this value. It cannot be used as part of an msmq-polling-consumer. There is a Microsoft MSMQ best practice document which is available for download: http://download.microsoft.com/download/F/C/9/FC9989A2-DA75-4D96-B654-4BD29CF6AEE1/MSMQBestPractice.doc. The following are the best practices that we have found to increase overall performance and reliability of MSMQ. The accepted best practice for overall performance is to not use public MSMQ queues; private queues are preferred. A public queue is published in Active Directory (only a domain admin can create them), and the domain controller is queried when the queue needs to be found (e.g. when opening the queue). Private queues are not published in Active Directory. A drawback of only using private queues is that the MSMQ Message encryption during transit between queue managers is not supported. If security during transit is of high importance, then you should use public queues. To enable message encryption on a queue, it should be created with a privacy level of either optional or body. If created with a privacy level of body, then messages that are not encrypted will be discarded. computer\private$\queue : private queue (interrogates AD to find the computer) = DIRECT=OS:computer\private$\queue : private queue (do not use AD, use the operating system to find computer and connect directly to access the queue. A drawback of only using directly addressed queues is that the MSMQ Message encryption during transit between queue managers is not supported. Remote reads are not supported in transactions. When you do a remote read, the message body will pass between the reader and the remote computer, even if not required. Journaling can use up disk space quickly. If you must use journaling, to increase messaging performance, purge messages in all journal queues and dead-letter queues often.